Here it is in a nutshell: if you don't have an optical drive in your computer (those things that take those shiny BD, DVD, or CD discs), and you want to install Windows 8 or Windows 8.1 on that computer, you'll need to get the Windows 8 installation files onto some kind of media that you can boot from. Fortunately, the ubiquitous and inexpensive flash drive, or any other USB based drive, is a perfect solution. While many computers don't have optical drives, they all have USB ports... thank goodness. Once you have those installation files onto a flash drive, which is exactly what we'll show you how to do over the course of this tutorial, you can move on to the actual Windows 8 installation process, which we also have a complete tutorial of - but we'll get to that at the end. If you have an ISO image of Windows 8 and actually do have a DVD drive in the computer, you don't need this tutorial at all. Just burn the ISO to a disc and then install Windows 8. We created this step by step walkthrough in addition to our original How to Install Windows 8 From a USB Device guide. If you're familiar with booting from removable media, working with ISO images, and installing Windows, then those instructions will probably be enough for you. Otherwise, we recommend continuing through this tutorial, which is considerably more detailed. This flash drive, or any USB storage device you'd like to use, should be at 4 GB in size if you're planning on installing a 32-bit version of Windows 8 or 8.1, or at least 8 GB in size if you're planning on a 64-bit version. A 5 GB drive would do, but the next easily available size after 4 GB is 8 GB. This USB drive also needs to be empty, or you need to be fine with erasing everything off of it as part of this process. If you don't have a spare flash drive around, you can pick up a 4 GB or 8 GB one for under $15 USD at most retailers. If you're not in a hurry, you can usually get an even better price at online retailers like Amazon or NewEgg. Windows 8 (or Windows 8.1, of course) is available for purchase as either a physical DVD disc, or as an ISO file. Either is fine but there's extra step to take if you have a real DVD. We'll get to all of that in a little bit. If you bought Windows 8 from a retailer other than Microsoft, you probably have a DVD. If you bought it from Microsoft directly, you had the option of having a Windows 8 installation DVD shipped to you, downloading a Windows 8 ISO image, or both. So, if you have a Windows 8 DVD, find it. If you downloaded an ISO image of Windows 8, locate it on your computer. Be sure you find the product key that accompanied that purchase as well - you'll need it later on. If you don't have a Windows 8 installation DVD or ISO image, then yes, you'll need to buy a copy of Windows 8 to continue. Try Amazon or see Where Can I Download Windows 8 or 8.1? for a few other options. The last thing you'll need is access to a working computer. This can be the computer you're about to install Windows 8 onto, assuming it's working, or it can be some other computer. This computer can be running Windows 8, Windows 7, Windows Vista, or Windows XP. If what you're working with now is a Windows 8 DVD (verses a Windows 8 ISO image), make sure this computer you'll be borrowing has a DVD drive, too. Now that you have a flash drive, your Windows 8 media, and access to a working computer, you can work on getting those installation files from that disc or downloaded onto your flash drive so you install Windows 8. Continue to Step 3 if you have a Windows 8 DVD disc and need that on a flash drive. Continue to Step 4 if you have a Windows 8 ISO file you downloaded and need that on a flash drive. Build an ISO Image File With the Disc. As you already know, that Windows 8 or Windows 8.1 DVD disc you have isn't going to do you any good as it is because your computer doesn't have an optical drive to stick the DVD into. Unfortunately, you can't just copy the files from the Windows 8 DVD directly onto the flash drive you want them on and expect that to work. The Windows 8 installation DVD first has to be converted to an ISO file (this step), and then that ISO file is used to populate the flash drive with the proper files for installing Windows 8 (the next several steps). You'll need to complete this step from that other computer you have access to - the one with the DVD drive in it. You'll need your Windows 8 DVD at this computer but you won't need the flash drive quite yet. Creating an ISO file from your Windows 8 DVD is no different than creating an ISO file from any kind of disc. So, if you have experience "ripping" data-based discs, go for it, and then continue on to Step 4 when you're done. Otherwise, see How to Create an ISO Image From a DVD for a tutorial and then continue to Step 4 after you're done. Don't let this side-project scare you off - creating an ISO image of your Windows 8 DVD isn't hard, especially if you follow the instructions we just linked to. All it involves is installing some free software, clicking a few buttons, and waiting several minutes. Save As Screen for the USB/DVD Tool (Chrome in Windows 8). Here's where we begin the real work of getting that Windows 8 or Windows 8.1 file in ISO format transferred to your flash drive or other USB storage device. To do this, you'll need to download a free tool from Microsoft called the Windows 7 USB/DVD Download Tool. Don't worry that Windows 7 is in then name. Yes, it was originally designed for use as a way of getting a Windows 7 ISO onto a flash drive, but it works perfectly fine for Windows 8 and Windows 8.1 ISO images. The name of the file you'll be downloading is Windows7-USB-DVD-Download-Tool-Installer-en-US.exe, it is 2.6 MB in size, and comes directly from Microsoft.com. With the help of this program, over the next several steps, we'll get the flash drive properly formatted and the Windows 8 installation files properly copied to it. Once complete, you'll be able to use this flash drive to install Windows 8. While it may be tempting to try, you can't just copy the contents of the ISO file, nor the ISO file itself, to the flash drive and expect to boot from it and install Windows 8. It's a little more complicated than that, thus the existence of this tool. Installing the Windows 7 USB/DVD Download Tool. Now that the Windows 7 USB/DVD Download Tool program is downloaded, you'll need to install it. As a reminder, the Windows 7 USB/DVD Download Tool works perfectly well for creating bootable installation media for Windows 8 and Windows 8.1. Also, the program itself runs on Windows 8, Windows 7, Windows Vista, and even Windows XP. To get started, locate the Windows7-USB-DVD-Download-Tool-Installer file you downloaded, and run it. Depending on what version of Windows you're installing this tool on, you may be required to first install .NET Framework. This is a free program that's also provided by Microsoft, so be sure to complete that installation first if you're asked to. Tap or click on Next. Tap or click on Install. Wait while the installation occurs (as shown above). This will only take a few seconds. Tap or click on the Finish button. That's it. It's a small program. Next up we'll run the program, provide it the Windows 8 ISO image you downloaded or created from your DVD, and have it properly format and then copy the installation files to the flash drive. Now that the Windows 7 USB/DVD Download Tool is installed, you'll need to open it to start the process. At least with most computers, the installation you completed in the last step created a shortcut on the Desktop called Windows 7 USB DVD Download Tool. Open that. Having trouble finding the shortcut? The icon it uses looks like a folder with a download arrow and shield, as shown above. If you're presented with a User Account Control prompt after opening, tap or click Yes to continue. Windows 7 USB/DVD Download Tool. Once the Windows 7 USB/DVD Download Tool is open, you should see the window above, with Microsoft Store in the title bar. Click or tap on the Browse button. Choosing the Windows 8 ISO File. In the Open window that appears, locate the ISO image you created from your Windows 8 or Windows 8.1 DVD, or the ISO image you downloaded from Microsoft if you bought Windows that way. If you downloaded Windows 8 from Microsoft and aren't sure where you saved it, check for the ISO file in your computer's Downloads folder since there's a good chance that it's in there. Another way is to use Everything to search the whole computer for the ISO file. If you created an ISO from your Windows 8 DVD, that file will be wherever it is you saved it to. Once the Windows 8 ISO file is selected, click or tap on the Open button. As you can see in the screenshot above, my Windows 8 ISO file, which I created myself from a Windows 8.1 DVD, is named windows-8-32.iso, but yours may be something entirely different. Windows 8 ISO Loaded & Ready. After choosing the Windows 8 or Windows 8.1 ISO image in the last step, you're taken back to the main Windows 7 USB/DVD Download Tool screen where you should see the ISO file you chose as the Source file. Confirm that this is the right ISO file and then tap or click on the Next button to continue. Windows 7 USB/DVD Download Tool "Choose Media Type" Option. Next up in the Windows 7 USB/DVD Download Tool wizard is Step 2, titled Choose Media Type. Your goal here is to get your Windows 8 or Windows 8.1 setup files onto a flash drive or some other USB storage, so tap or click the USB device button. See that DVD option? That will properly burn the ISO image you've loaded into the tool to a DVD disc but that's probably not particularly helpful since you're here because you don't have an optical drive on the computer you're planning to install Windows 8 on. Besides, it would be much easier to use an image burner to do that. See How to Burn an ISO Image to a DVD for more on that if you're interested. Windows 7 USB/DVD Download Tool "Insert USB Device" Screen. You should now see the Step 3 of 4: Insert USB device screen, as shown above. In this step, you'll choose the flash drive or other USB device you'd like to copy the Windows 8 installation files to. Find the USB device in the drop-down box and then click or tap the green Begin copying button. If you haven't attached the USB device yet, do so now and then hit the little refresh button next to the list. Give the tool a few seconds and then it should show up as an option. If you do have drives listed but you're not sure which one is the right one to choose, unplug the USB device you want to use, hit refresh, and note which drive goes away. Reattach it, refresh again, and then choose that drive. If all you ever get is a No compatible USB devices detected message, you may have an issue with the flash drive or other USB storage you're using, or even some issue with your computer. USB Device Must be Erased Message. You may not see the Not Enough Free Space message shown above, so if not, just continue on past this (and the next) step. If you do see this, touch or click on the Erase USB Device button to erase the flash drive in preparation for the copying of the Windows 8 or Windows 8.1 installation files. This was mentioned early on in the tutorial, but now is a good time to remind you that anything on this portable drive will be permanently erased as part of this process! Move things off now if you need to. Confirmation of the USB Device Erasure. Assuming you saw the last message about needing to erase the drive, and you then chose to do so, you'll see this one, too, asking if you're really, really sure that you want to do it. Tap or click on the Yes button to confirm that you want to erase the USB drive. Finally we're getting somewhere! The flash drive, or whatever USB storage device you're using, is being properly formatted so it can be booted from, a necessary step to install Windows 8 or Windows 8.1. You'll see the Formatting... status for several seconds, maybe longer. How long depends a lot on how large the USB drive is - the larger it is, the longer this part will take. This short stage in the process is really the key as to why you need to use the Windows 7 USB/DVD Download Tool instead of just tossing the files on a flash drive. Copying Windows Installation Files to the USB Drive. After the formatting is complete, it's time for the actual copying of the Windows 8 or Windows 8.1 installation files. The Copying files... status will last a lot longer than the formatting status, perhaps as long as 30 minutes or more. How long this takes depends on a number of variables like the maximum USB speed supported by the USB device and the computer, how fast the computer is, and how large the Windows 8/8.1 ISO image is. The percentage indicator may pause at 99% for a bit longer than it may have at any other percentage indication prior to that. This is normal, so don't cancel the procedure and start over thinking that something is wrong. Confirmation of Successful USB Device Creation. Assuming everything has gone according to plan, the next screen you should see is the one above, titled Bootable USB device created successfully, a progress indicator of 100%, and a status of Backup completed. Technically, you're done. Not with installing Windows 8/8.1, of course, but you have gotten those Windows 8 or Windows 8.1 installation files from the DVD or ISO file you started with onto this USB device. To actually use this portable drive to install Windows 8, you'll need to boot from the drive, which we explain below. Boot From External Device Prompt. Now that the you have a flash drive or USB based hard drive with the Windows 8 or Windows 8.1 installation files on it, you can use it to start the Windows 8 installation process on the computer that you want to do that on. Attach the USB drive to the computer you want to install Windows 8 on. Watch for a message about pressing a key to boot from the device. Press a key to force the computer to boot from the USB drive instead of the hard drive. Wait for the Windows 8/8.1 installation process to begin. Sometimes 3 and 4 aren't part of the process, depending on how your computer is configured. Sometimes the boot order needs to be changed in the BIOS to make this happen, sometimes the USB port used isn't the one that the computer motherboard prefers for booting from, etc. If you run in to any problems, see our How to Boot From a USB Device tutorial for help. The instructions there are much more detailed and there are several suggestions on what to try if you're having trouble getting your computer to boot from the USB drive. If even that doesn't help, you may need to take some extra steps to boot from this Windows 8 USB drive. See Tip 1 at the end of How to Install Windows 8 or 8.1 From a USB Device, the condensed version of this tutorial. Once you get your computer to boot from the Windows 8/8.1 USB drive you made during this tutorial, the installing Windows part should be a breeze. Continue on to the next step and we'll get you started with that. If that USB drive you just created with your Windows 8 or Windows 8.1 installation files on it booted properly, the next thing you'll see on the screen is a Windows 8 logo, followed soon by the Windows Setup screen shown above. Installing Windows 8/8.1 is a fairly simple process. For the most part, you can just follow the process presented to you on the screen and an hour or so later you should be enjoying Windows 8. However, there are certainly a few places where you may have questions as to what to do next. See How to Clean Install Windows 8 or 8.1 for a complete walkthrough of the process. In that tutorial, we show you every screen you'll see during the installation process, from the start of it (pictured above), all the way to the finish line. That Windows 8 installation tutorial linked above starts you at the very beginning of the process, something helpful for those that start out with a Windows 8 DVD. 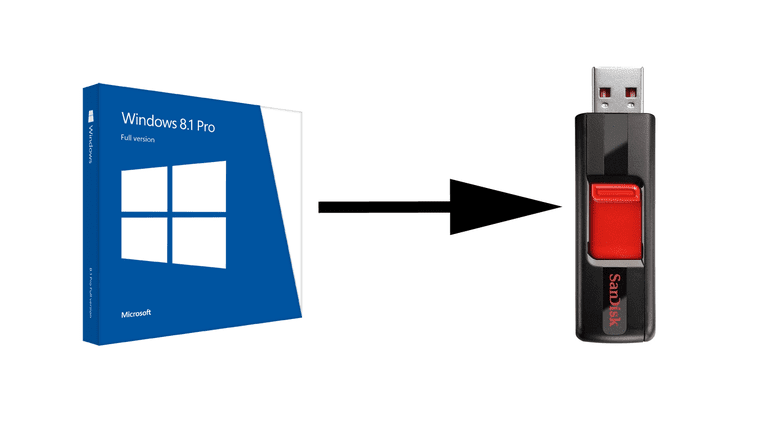 Since this tutorial walked you through creating a USB drive with Windows 8/8.1 files on it, as well as the boot process, you can start at Step 4 in that tutorial instead.